PINCKNEYVILLE — The picture shows an infant, in a gown that looks pink, a stuffed animal above its head, and two more near its torso. She looks asleep, her porcelain-looking complexion almost blushed. “Baby Sarah,” had she lived, might have had a grand time planning her own Sweet 16 birthday party. Instead, some of the same people who helped prepare her for burial or raised funds for memorials or wondered about who abandoned her in a plastic bag beside a nearby lake are preparing to commemorate her short life on what would be her 16th birthday. The observance begins at 11 a.m. Saturday at Pinckneyville City Park. Perry County Sheriff Steve Bareis also wants to call attention to the fact that the investigation into the death of “Baby Sarah” — as staff in the department named her — is still active. He became involved with the case after he joined the sheriff’s department later on in the year that Sarah was found. 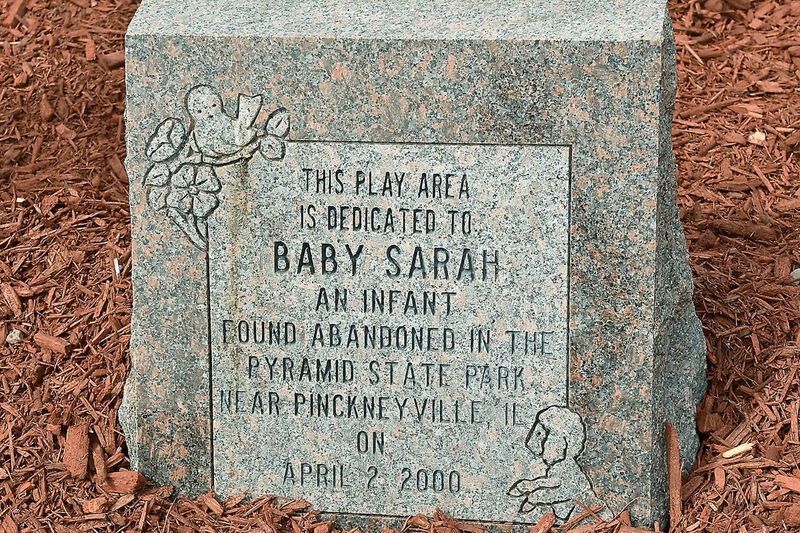 Baby Sarah was found by two fishermen on April 2, 2000, on a boat ramp near Spring Lake in Pyramid State Park near Pinckneyville. The baby, thought to be a month premature, was white and weighed about 6 1/2 pounds. She was found stuffed in a bag from 710, a bookstore on the campus of Southern Illinois University, and wrapped in a towel and used baby blankets. The baby was “wrapped in a dark green Walmart towel, a used and laundered baby blanket with baby bears and small flowers, and another blanket with balloons and carousel horses. The carousel blanket was made from a Walmart kit and was unfinished,” according to a June 2002 Southern Illinoisan newspaper article. The bag was not in the water, so it did not wash downstream, Bareis said. He believes whoever left the baby wanted her to be found. Investigators know the baby was there at least a day earlier, as another local person had seen the bag, but disregarded it. An autopsy, though, was “inconclusive” as to the cause of Baby Sarah’s death. It was determined that she was taken from the womb “quickly.” When found, she was still attached to her mother’s umbilical cord. He said two local women were tested but later found to not be the mother of the infant. On Saturday morning, the Perry County Sheriff’s Office and Perry-Jackson Child Advocacy Center plan to lead a celebration of the baby’s life, followed by the 14th Annual Family Fun Day, from noon to 2 p.m.
At 11 a.m., organizers plan to celebrate Baby Sarah’s short life with a balloon release and snacks in the Pinckneyville City Park, which was dedicated to her so many years ago. Playground equipment in the park was paid for by some of the donations left over after paying for expenses for her burial. Betti Mucha, executive director of the Perry-Jackson Child Advocacy Center, said she was in the area when Baby Sarah was found, but had forgotten about the unresolved death as time went on. Dawn Geras, president of the Save Abandoned Babies Foundation, was not aware of the “Baby Sarah” case, but noted that today marks the kickoff of Save Abandoned Babies Month. Her organization exists to raise awareness about the Illinois Safe Haven Law, which allows a parent to drop an unharmed newborn (up to 30 days old) at a hospital or police or fire department, with no questions asked. As of 2016, some 3,153 infants have been left at safe stations, 112 of them in Illinois. On March 12, a 28-year-old Staten Island, New York, woman was arrested after she went to a hospital seeking treatment for bleeding and investigators realized she’d given birth. Her baby was found dead, discarded in a garbage can outside her house. The next day, March 13, across the country, police went to a University of Illinois dorm in Champaign where they found a newborn boy, dead, in the backpack of a U of I student. That student had reportedly been in the bathroom for hours. Investigators were told that the mother had given birth earlier in the day. “(The month was declared) to create awareness that the Baby Safe Haven Law does exist and that cases like Baby Sarah’s should never need to happen again,” Geras said. To would-be-mothers and fathers finding themselves overwhelmed, embarrassed or scared about a childbirth and pending pregnancy, Geras said, don’t be scared. Baby Sarah is not forgotten, if the pink and yellow rabbit and egg decorations at her grave, three days after Easter 2016 are any indication. She is buried near the back of the Mueller Hill Cemetery, where a lichen-moss covered cross is stuck in the ground, a small scarecrow at its base. For awhile after Baby Sarah was buried, deputies paid special attention to the cemetery, hoping to see the baby’s mother be among the graveside visitors. Though he came aboard after Baby Sarah was found, Bareis has a special connection to the case. Unable to have children, he and his wife adopted a newborn girl, whose birth-mother gave her up for adoption two days after she was born. The Perry County Sheriff’s Office is still offering a $5,000 reward for information regarding who the real parents of “Baby Sarah” are and what happened that day. Anyone with information regarding this case can call the Perry County Sheriff’s Office at 618-357-5212 or leave a message with information online at perrycountysheriffsoffice.com (go to contact page).